Posted by Jon in Metal Gear Solid, Review, Third Party with 0 comments. I generally don’t pay too much attention to the 1/6 scale market. The only reason that this figure ended up on my radar is because about a month ago, Hideo Kojima himself retweeted a few pictures of this figure that a fan had posted. The pictures were impressive. Naturally, I did some investigating and found out that the figure was put out by a company called LIMTOYS. After a little window shopping on eBay, Ismael was secured and heading my way from Hong Kong. I’m an easy mark for Metal Gear Solid, and it’s looking less and less like officially licensed toys will exist going forward. Warning, I’m going to have to get into some spoilers in order to describe things from here on out. So if you are still worried ruining this two year old game, I’d probably stop reading now. There is a regular Leather Jacket version that only includes the parts for Ismael (Ishmael), code name for Big Boss. The leather jacket look is what Big Boss wears at the end when he’s revealed to be the one who helped Venom Snake escape the hospital. I would consider this the base model. Next, there is a deluxe release of the Leather Jacket set which includes all of the Ishmael parts, but also includes a head and additional accessories to make Aehab (Ahab). Ahab is the code name for Venom Snake, the main character of the game. This is also the set that I am reviewing for this piece. Finally, there is a clothing pack that includes Venom Snake’s camo outfit and the rest of his bionic arm. The pack does not include a body or any sculpted parts. So realistically you need to buy the deluxe release and this pack to complete the tactical camo look. Sure, this is an unofficial product, but LIMSTOYS is still very respectful to the intellectual property they are ripping off. Snake and all of his accessories are packed in a large box protected by foam. The artwork is also really nice. It tries to be as Metal Gear Solid V as you can without actually being Metal Gear Solid. 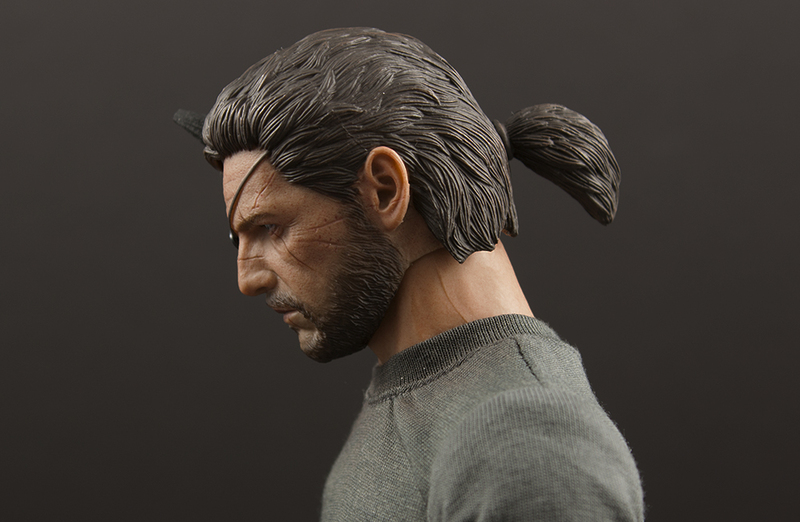 Both of the head sculpts for Big Boss and Venom Snake are incredible. The likenesses for both characters are just about spot-on. What really impressed me was the detail work that went into Venom Snake. All of the scarring, damage, and hair structure seems just about perfect. As a little bit of a bonus, they also included a second, longer shrapnel horn if you want to go for his ‘demon‘ look. Most of my gripes with this figure are with the body, so I’m a little curious how well these heads might transplant to a Hot Toys true-type blank? One of the more creative accessories is his I-Droid unit. By itself, it’s accurate to the game but not all that impressive. Where the accessory shines is it has an optional ‘hologram‘ part that plugs into it. When plugged in, it simulates the I-Droid projecting an image of the game map. I really appreciate the effect, it’s really neat and I’m considering using it as his forever display pose. The amount of accessories included is pretty staggering. If it wasn’t for my need of the Venom Snake head, I may have been willing to go for the regular release. I doubt I’ll buy or attempt to dress him up in the camo kit. While I like the look, 1/6 scale tailored clothing is the bane of my existence. The less i have to mess around with it, the better. Dealing with unofficial action figures is always an adventure. There are a few things to look out for when you pull this figure out of the box. First off, make sure that you have a hair-dryer handy. You may need to heat up a few joints in order to loosen them or pop them out of the socket. Straight from the box, both of my figure’s elbows were fused shut. I tried forcing them a bit while under his jacket and I felt like I was putting on too much pressure. I removed the jacket, hit the joint for about a good minute with the hair-dryer, and then nudged them back and forth. If your elbows are fused, make sure to cradle both ends of the elbow so that you don’t snap the pin connecting it to the bicep. Mine turned out fine in the end, but that joint could be an issue if not tackled with caution. In order to swap out the human hands for the bionic ones, you’ll need to remove the wrist ball-joint. I found that the hands took a lot of force to remove, but they would disconnect from the wrist instead of with it. Again, I pulled out my hand hair-dryer and heated up the joint. Then pulled them out with a pair of pliers. All of these tight, scary joints certainly reinforce my appreciation for how easy it is to swap out appendages on Mezco’s One:12 Collective figures. Finally we have the head. He came packed with Big Boss’s head attached to the body. Unfortunately when I pulled the head off to swap in Venom Snake, the barbell popped right out of the neck. To continue this comedy of errors, when I pulled the barbell out of the head the connector came with it. I didn’t have any issues getting the barbell back into the body, but it doesn’t seem long enough to peg securely into the Venom Snake’s head. Would I recommend LIMTOYS Ismael Deluxe Leather Jacket Version? You are going to pay somewhere between $220 – $250 for the deluxe leather jacket version. Very close to the price of a non-diecast Hot Toys release. The Phantom Pain is one of my favorite games ever, but even then I still have some reservations over this purchase. Part of that may just be my incessant need to manhandle action figures. I’ve already broken off one of his wrist pegs (luckily they include a spare), and I’m still afraid to mess up his clothes. So for the price I’m more inclined to find a pose I like, and leave it like that forever. That’s not as much fun, and certainly makes me question my recommendation. However, I’m also not a huge 1/6 scale collector. The amount of care and preparation this figure requires just isn’t something I’m used to. Perhaps that is the norm? I don’t recall having the body issues I’ve had here with a Hot Toys release. This is why I took care to detail as much about the opening of this figure as possible, so hopefully you get an informed view of what to look forward to if you do decide to purchase this figure. In conclusion, I don’t recommend this figure. I expect a certain amount of fiddliness with a 1/6 scaled figure, but this one is downright fragile in some areas. If the price of the figure was lower I would probably be a little bit more forgiving. But at $220 – $250 this figure is in Hot Toys’ price range and I’d hope for better craftsmanship.